This week we reflect on a relatively small number of scriptural passages which confirm our forgiveness in Jesus Christ. 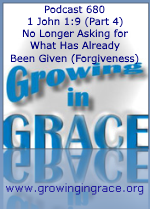 It’s “forever forgiveness” that occurred through one righteous act at the cross of Jesus Christ. His blood not only brought a permanent forgiveness of all sins (past, present and future), but cleansed us from all unrighteousness. The work of Jesus has already brought us the gift of justification, righteousness and sanctification. In him we are new, alive, clean, holy, perfected and so much more. In addition to our previous programs in this series, part of our goal is to help believers understand that the context of 1 John 1:9 was not meant for us to keep trying to remember all of our sins, mistakes and shortcomings in order to try confessing all of them be forgiven again. The church has failed to realize this keeps people in a sin consciousness which Jesus came to free people from. It only brings a temporary emotional release from guilt, leaving people with a false identity by thinking they are just sinners who can’t seem to overcome. A better way to living in victory is placing faith in what Jesus did, and that it was more than enough.